The site of Virtual Architecture Competition -Build Live Japan 2015-. 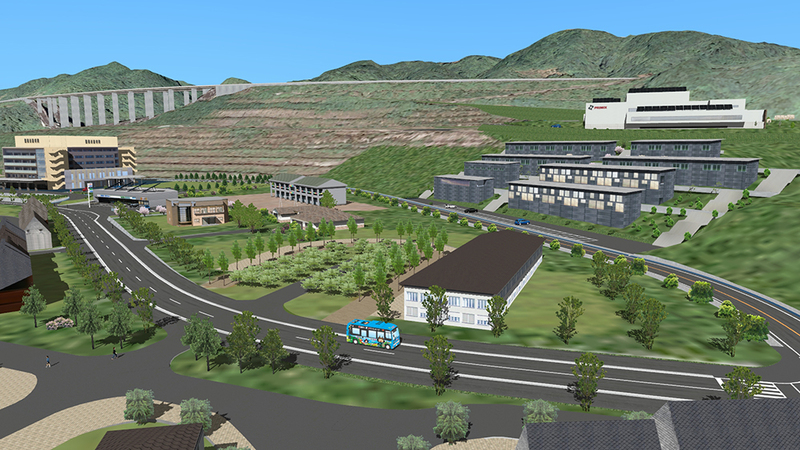 Here, designers and local municipality scramble to turn the Kitsuki castle town into a 3D VR replica via point clouds to allow quick comparison and easy snapping of proposed 3D building models into the virtual world. 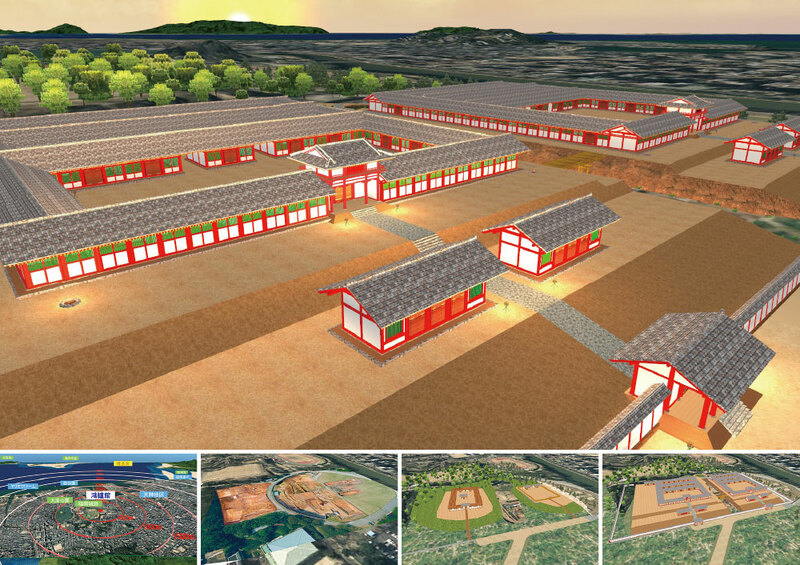 All proposals are openly available to citizens to review, to evaluate that the finished project could truly blend in and stay consistent to the ancient architectures of the castle town. The attempt was well received and demonstrates how VR can indeed help in urban planning. This project data can actually be divided into 12 sub-proposals, with 12 different camera positions assigned to each of them. Executing the script allows viewers to view the entire project area and perform before & after analysis to contrast the changes that have been done. The Korokan Ruins discovered in 1988 which is located in the center of Fukuoka, Japan and the research is still being conducted. Whether this important historic sites should be rebuild or not was discussed between voters and this VR data was created as a basic data for explanation to relevant people. Also it was helpful enough as the education material which allows people to know the situation of the time and have been used on the museum and government's HP as an advertisement for citizens too. The animated script "presentation" takes viewers to the Korokan site, with explanations of its history, function, and the proposed image upon restoration. In the history portion of the script, the interiors adapt to different design styles of Japanese historic eras. Candle night-lightings of the restored site is also an exciting sight. Debris avalanche and mountain slides are becoming more common in Japan recently, and there has been high hopes of using soil check dams to counter these. However, due to its rarity, a wide adoption cannot be achieved without effective communication with the local residents. This VR data visualizes the risk maps of debris avalanche under different conditions and severity, while demonstrating the effectiveness of check dams in a comprehensible way. By playing back the script "Present", followed by "Incident", viewers will be introduced with the current environment situation and witness the steep angles at the proposal site, as well as experience how severe the hazards will be in case of a debris-flow. In the script "Improvement 3", different types of land check dams have been constructed at the same site for landscape evaluation. The script "With Explanation" offers further explanations. We have explored an improvement in the surrounding environment of Higashi Takase river as a region's issue. This year, we investigated about the river flow rate from river cross-section and about available heavy machines from the width of surrounding roads. The environment where the enough river cross-section is secured and people around the area get together is proposed in this data. Takasegawa is a beautiful river canal in Kyoto, but the downstream section, Higashi (east) Takasegawa, is nowhere as eye-pleasing nor safe as its upstream cousin. 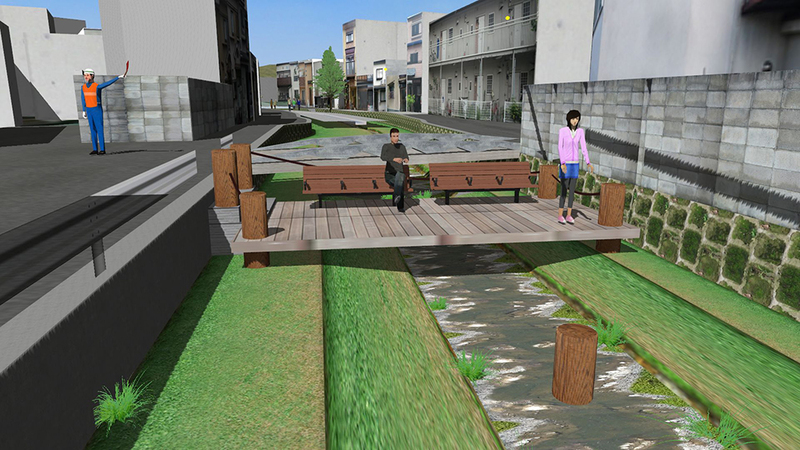 Upon executing the animation script "East-Takasegawa Proposal 2015", an improvement proposal, with hazard mitigation and ease of construction taken into account, will be introduced to the viewers. Detailed engineering considerations such as fluid flow and road width for heavy machineries have all been considered to ensure a realistic evaluation of project feasibility. Some interesting parts of this proposal include a riverside promenade, which requires a double-layered structure, and the use of decks and scaffolds to ensure ease of construction. 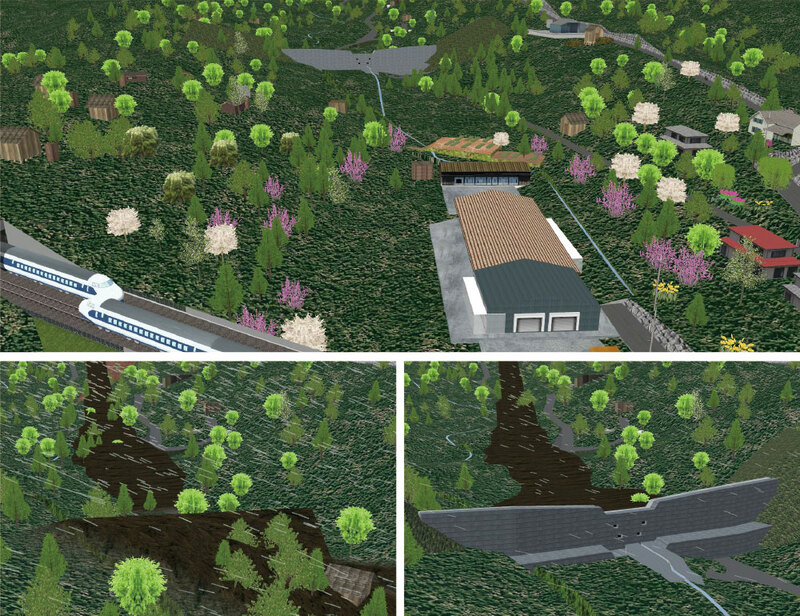 This is a virtual replica of the nature-rich Akashi Kaikyo National Government Park, the home of Japan Flora in 2000 - with proposals to further adapt them for commercial activities. The making and theme of the various parts of the Park is demonstrated in a comprehensible way with the intent of attracting more attentions from corporates for business developments. The vision aims at creating a convenient but compact city, with health care, offices, and residential zones divided clearly inside the 3D data. The camera position "Overview 01" and "Overview 02" gives an overview of the entire project site area and the Sustainable Park. By executing the Project Overview script, viewers will be taken on a virtual tour inside the park and will be introduced with the numerous proposed zones, including; "Commercial-Residential Zone", "Welfare Zone, "Residential Zone", and "Business Park Zone". The most satisfying part of the 3D environment is looking down at the entire town from the hills facing the Osaka-Bay. This is a VR data used in a driving simulator for the demonstration and promotion of on-board wide angle camera and Miracast system in cars. The wide angle camera is used to help navigating through various blind spots or high-risk areas, such as parking lots, residential areas, wide avenues, and expressways. It is also capable of parking assists and has sensors to warn of suddenly approaching hazards and protruding of parking lines. Furthermore, the Miracast feature allows the streaming of smartphone contents into the vehicle navigation monitor to gain the latest versions of maps or the operation of various smartphone apps. By executing the scenario "Cloud Ver. Demo", a vivid, overview image of smart onboard technologies will be shown. For example, blind spot clearing features that helps drivers check for suddenly approaching pedestrian or cars at very narrow places such as freeway interchanges or parking lots. A part of Southern China region is recreated inside a 8-DOF driving simulator, to test a tunnel project. The driving simulator is used to examine the various types of driving behaviours at the tunnel's entrance and exit. By basing on the behavioural findings and vehicle log data, engineers evaluate the effectiveness of the underground expressway and safety, and devise countermeasures for any problems found and perform advices for the contractors. Execute the script "underground highway, takes users onto a quick tour to explore the underground highway. Finally, the script "Entrance Shadow"showcases the unique entrance design with a simulation of its shadows. 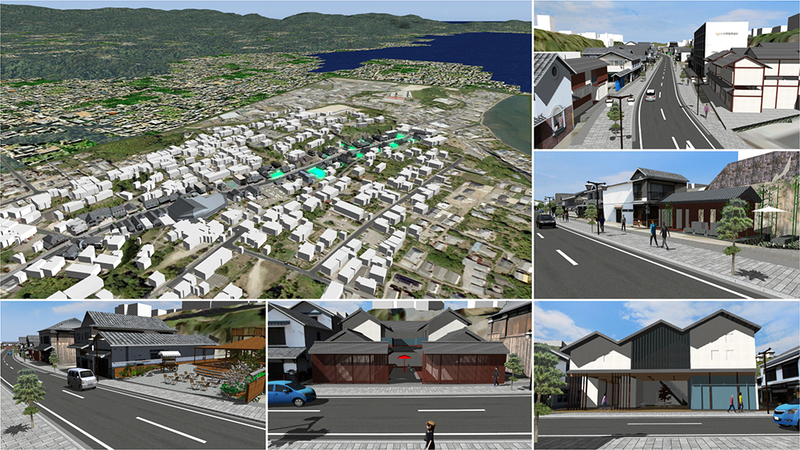 This is the landscape VR simulation of surrounding area of "The town with fishing port". Creating the landscape VR simulation makes it easier to check the school roads and road conditions etc. Furthermore, it is possible to change the weather and time, which will be able to be used for extracting improvement points for the future road maintenance. Playing the Script1 script will introduce the viewer an overview of the town through bird's eye view and first-person perspective. The saved camera position include a fishing port, roadway intersections, and the construction site. 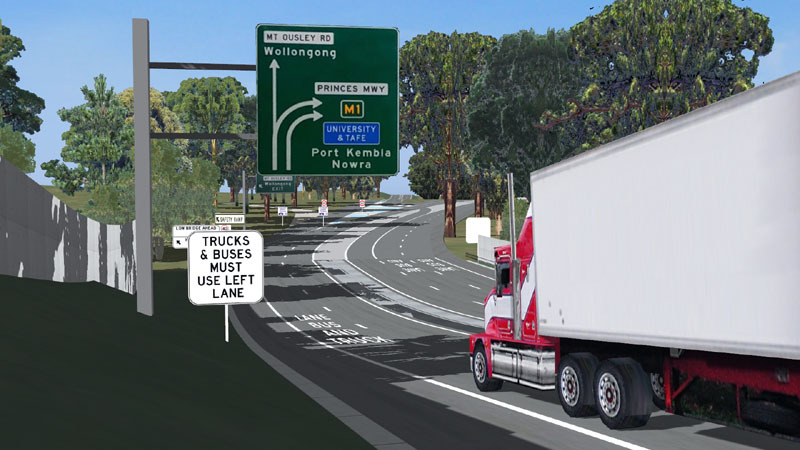 A 3D virtual model of 11km of the Princes Motorway, south of Sydney, with scenarios - both for demonstration and interactive driving- to show how CIT systems will work. On the descent into Wollongong, trucks are limited to 40kph and must stay in the left two lanes, while other traffic is going 80kph. The scenarios show a truck cab that displays warning messages for the several kinds of situations. By following the saved camera positions consecutively, viewers can see the current road condition of the Princes Motorway and its various interchanges and intersections. 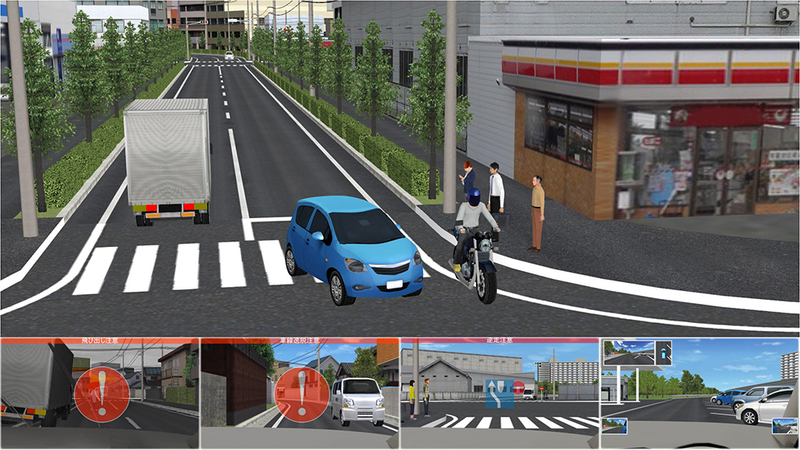 Upon executing the MtOusley-Intro scenario, various safety warning messages regarding leading cars and intersection hazards, allowing users to have a glimpse of cutting-edge road safety research. This is the VR data used for a large driving simulator used in researches in the Nagoya University to achieve a distant dream - achieving a "Green Mobility Society" without compromising on safety. The street roads between Nagoya Interchange and Nagoya University was precisely recreated, and have numerous scenarios tailor made for different researches. This is the data used inside the World's first 4K 3D 6-DOF CAVE simulator for maximum VR simulation immersion. A 7 km journey from the Nagoya Freeway Interchange to Nagoya University has been made. 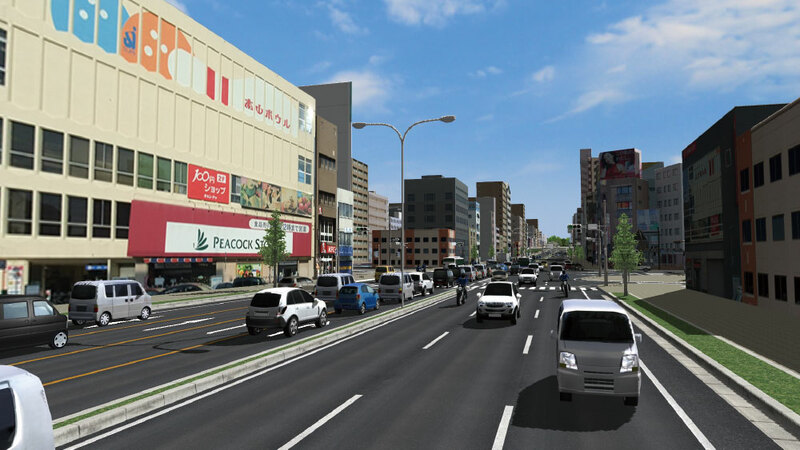 In the animated script, viewers will be introduced a 3D replica of the urban environment surrounding the roads, which include the Kamiyashiro-Junction, Higashiyama-Park, and a portion of Nagoya University. 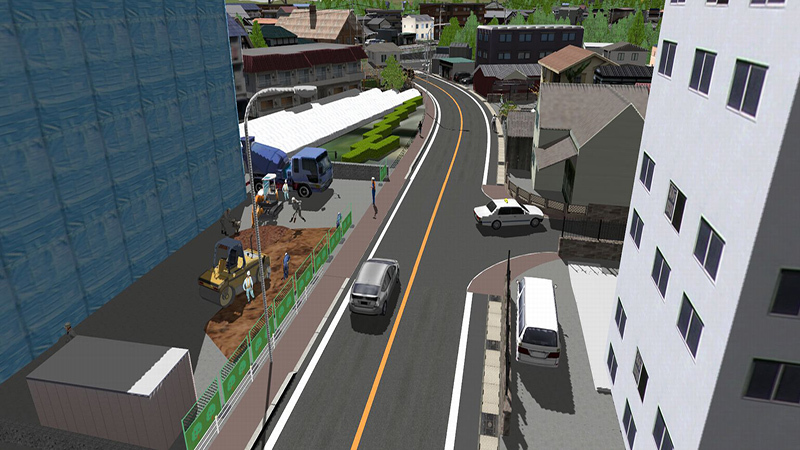 What is interesting about this project data is the precise recreation of the Yamate-Greenroad, a complex road section that is known to have numerous upslope, downslope, and curves on a straight road - an excellent (virtual) testbed. 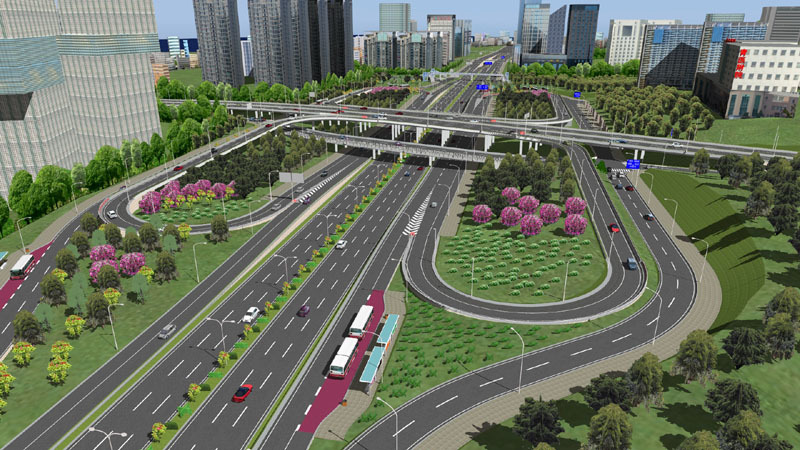 The government of Qingdao, China uses UC-win/Road to evaluate various designs of a proposed clover-shaped highway interchange. By coordinating with VISSIM analysis results, the complicated neighbouring traffic conditions is recreated and the traffic signals fully optimized to ensure maximum evaluation accuracy. Following the camera positions in numerical order, various large-scale objects such as multi-level interchange and neighbouring buildings that can be viewed from many different angles. 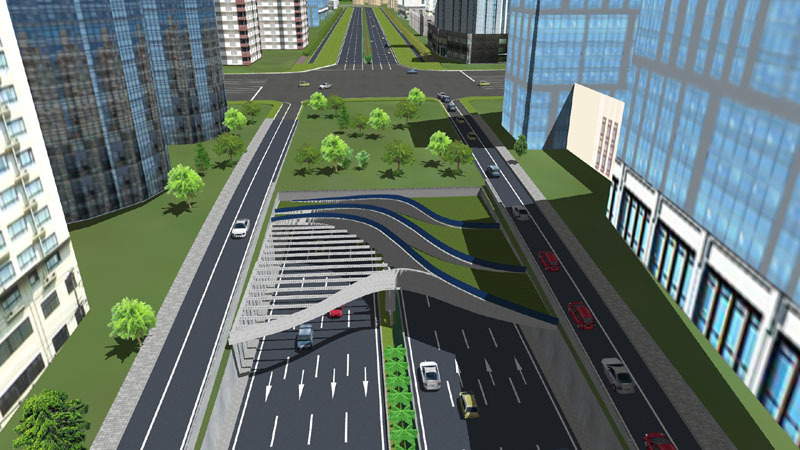 Executing the animated script "Multi-Level Interchange" will put viewers directly onto the roads or pedestrian bridges, allowing a more immersive sensation of the designs.